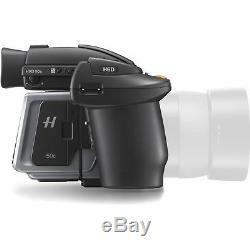 H6D-50c Medium Format DSLR Camera With Digital Back. 50MP 43.8 x 32.9mm CMOS Sensor. 16-Bit Color, 14-Stop Dynamic Range. Full HD 1080p RAW Video at 30 fps. Shutter Speeds: 60 min to 1/2000 sec. 3.0 920k-Dot Touchscreen LCD Monitor. Dual CFast and SD Memory Card Slots. Built-In Wi-Fi, USB 3.0 Type-C. Includes Body, Back, HVD 90x Viewfinder. What's In the Box. 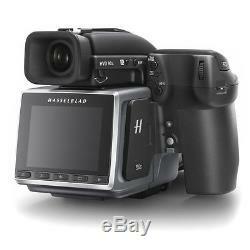 Hasselblad H6D-50c Medium Format DSLR Camera. Battery Grip for H6D Camera (7.2V, 3200mAh). Body Front Cap for H Cameras. What's In the Bundle. Bringing well-rounded shooting capabilities to the medium format realm, the Hasselblad H6D-50c revolves around a 50MP 43.8 x 32.9mm CMOS sensor to produce high-resolution stills as well as Full HD 1080p video. Coupled with an enhanced electronic platform with faster processing capabilities, continuous shooting speeds up to 2.3 fps are possible, as well as the ability to shoot Full HD video at 30 fps in the Hasselblad RAW format. Now suitable for multimedia image-makers, the H6D maintains its exceptional stills recording capabilities and adds versatile video recording abilities to its skill-set. Beyond imaging, the H6D also sports improved connectivity with the inclusion of a USB 3.0 Type-C connector for fast 5 Gbps transfer speeds and more fluid tethered shooting performance. The back itself incorporates a bright, clear 3.0 920k-dot touchscreen LCD monitor for live view shooting and intuitive settings control, and a Mini HDMI port is available for working with larger external monitors. In-camera saving is possible via dual memory cards slots-one CFast slot and one SD slot-and files can also be saved remotely when shooting tethered over USB 3.0. Built-in Wi-Fi can also be used in conjunction with iOS devices running the Phocus Mobile app, which permits wireless remote control of the camera as well as the ability to preview imagery and browse files. Willoughby's Camera is a real "brick-and-mortar" full-service camera store and photographic equipment retailer that has been in business on New York City for over 112 years. Our retail store is located in the heart of Fifth Avenue in beautiful Midtown Manhattan , where we have become a long-standing fixture in the community. We are located two blocks south of the iconic Empire State Building located in Midtown Manhattan, New York City. The 23rd-tallest in the world and the fourth-tallest freestanding structure in the Americas. Our Specialists know all about photographic products better than anyone, so if you need advice or want someone to guide you through a test drive, just ask us. Well take the time to answer all your questions. And because we dont work on commission, we wont try to sell you something you dont want. Well show you its key features, transfer your images, get you started with the basics, and more before you leave the store. Checkout Info terms text goes here. 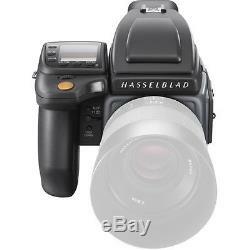 The item "Hasselblad H6D-50c Medium Format DSLR Camera With Digital Back Certified Pre-Ow" is in sale since Sunday, April 23, 2017. This item is in the category "Cameras & Photo\Digital Cameras". The seller is "willoughbyscamera" and is located in New York, New York.